It’s a perfect storm. Soaring income inequality resulting from stagnating wages and skyrocketing costs of living have created a situation in which 30 percent of all New York City households are severely rent-burdened, meaning they are paying more than 50 percent of their income toward their rent. Those statistics are simply staggering. Let’s do the math: Slice your net income in half and consider how much is left after you factor in your utilities, health care spending, groceries, transportation costs and clothes and toiletries, just to name a few. There’s not much, if anything, left is there? And if you have kids, well, you’re probably already in the red. We’re not just talking about statistics though; we’re talking about real people here. We’re talking about the elderly widow—let’s call her “Mary”—who walked into my office earlier this year because she fell behind on her rent. At 83, Mary was still working part-time and was looking for a second job because her Social Security check was just not enough. After falling behind in her rent, Mary’s landlord was evicting her and she had nowhere to go. Apparently, the job market for 83-year-olds isn’t what it used to be. Fortunately, my office was able to help Mary, but Mary’s story is not unique. Each and every day, I hear from constituents who are finding it increasingly more difficult to get by. Average New Yorkers are getting slammed by sky-high rents with no comparable increase in real wages. And, the people who were living on the edge are falling off the financial cliff. If you needed additional proof that the housing crisis is real, several weeks ago nearly 90,000 people applied to live in 55 units of affordable housing in the “poor door” building in my district. Though it was always cutthroat, today’s rental market feels more like “The Hunger Games” when tens of thousands of New Yorkers are fighting to live as second-class residents in an income-segregated building. We are at a critical tipping point in the struggle to save the very soul of New York City and some of its surrounding counties that are also covered by rent regulations. We are hemorrhaging thousands of units of affordable housing each year. By some estimates, we have lost more than 200,000 units of rent-regulated housing in three decades and 50,000 in the last three years. These “units” are home to thousands of middle-income and working-class families, and they are being replaced by ivory towers for the wealthy, and increasingly, the super wealthy. Where are average New Yorkers supposed to live anymore? While there are a number of methods, both legal and illegal, by which rent-regulated units are lost, vacancy deregulation is the single largest cause, accounting for 71 percent of all the losses of rent-regulated units. For those of you who may not be familiar, once a rent-regulated unit becomes vacant, landlords often make improvements and upgrades, such as installing new appliances or bathroom tiles. These changes then allow landlords to add a percentage of the total cost of the work (1/60th) to the rent. This is on top of a 20 percent rent increase the landlord automatically gets when an apartment goes vacant. If these additions cause the rent to increase to $2,500 or more per month, the point at which a rent-regulated unit becomes subject to deregulation, then the unit is no longer regulated and the landlord may charge a market-rate rent. Unfortunately, landlords are allowed simply to claim that renovations were made that propelled the rent above $2,500, and the validity of those claims is never checked. In fact, vacancy deregulation provides landlords with an incentive to harass their rent-regulated tenants or neglect to make repairs to their apartments until they have no choice but to leave. I see this scenario play out time and time again in the form of frivolous eviction lawsuits or other litigation, repairs that are never made and even threats and other strong-arm tactics. After months—and in the worst cases, years—of harassment and neglect, the tenants give up and leave, exhausted and often broke after fighting a battle against a deep-pocketed opponent that they simply cannot win. New York City has embarked on an aggressive plan to construct thousands of new units of affordable housing. The goal is admirable and the results desperately needed, but let me be clear: We cannot build our way out of the affordable housing crisis alone. We cannot build affordable housing fast enough to stem the losses from vacancy deregulation when we are losing two units of existing rent-regulated housing for every new unit that we build. This year, the rent laws, which keep housing affordable for more than two million New Yorkers are set to expire unless the Legislature takes action before June 15th to renew them. Now is the time for bold action, not half measures and appeasements. Straight renewal of the rent laws is not an option. Now is the time to put an end to vacancy deregulation. The real-estate industry has leveraged its considerable wealth into vast influence in the halls of state government and will stop at nothing to defeat us. As the prime sponsor of bill A.1865-A, which would repeal vacancy deregulation and save hundreds of thousands of units of affordable housing, I ask all of you who care about the future of New York to join me in Albany to fight to preserve it by putting an end to vacancy deregulation. Together, we can keep New York affordable for everyone. Assemblymember Linda B. Rosenthal is the sponsor to bill A.1865-A, which would repeal vacancy deregulation. She is the Chair of the Alcoholism and Substance Abuse Committee and represents the 67th Assembly district, which includes the Upper West Side and parts of the Clinton/Hell’s Kitchen neighborhoods in Manhattan. An incumbent who won a majority of a neighborhood once has an advantage when running again if the same folks are voting. Politicians always talk about the “loss” of units from vacancy deregulation when they mean the loss of current constituents…other people are living in those apartments, but they may or may not vote for the incumbent. On top of that, Ms. Rosenthal’s poster senior citizen, “Mary,” is not affected by vacancy deregulation in the first place. At 83, she can’t pay the regulated rent any more. If Mary earns too much to take advantage of the Senior Citizen Rent Increase Exemption, or if she cannot even afford her current rent, perhaps Ms. Rosenthal should focus on amending SCRIE or other subsidy programs. Vacancy deregulation affects tenants LIVING IN their apartments – even seniors whose rents are frozen by the Senior Citizen Rent Increase Exemption – because the law motivates landlords to oust regulated tenants. The profit motive ($1000 regulated vs. $4200 deregulated, for example) is enormous. 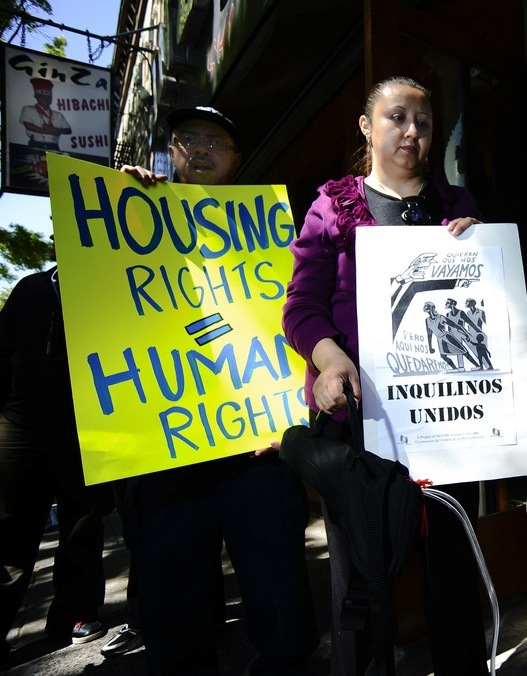 So even those who can afford the rent find themselves dragged into Housing Court on slim pretexts, or offered “buy-outs” inadequate to find them replacement housing. Vacancy deregulation also deprives future tenants of affordable homes. The City is losing a stock of affordable housing for the next generation. Preserving existing affordable apartments is a lot more economical than building new ones. Given the shortage of affordable housing, we need both new and existing affordable units. It’s a poor bargain for NYC to build 200,000 units of affordable housing as it is losing even more. Your ‘stock of affordable housing’ is not some publicly controlled resource but private property owned by landlords who have no choice but to pass on their very high NYC expenses to tenants. If they can’t maintain their properties we may have a repeat of the 1960s-1970s era of housing decline and abandonment. I understand that some tenants are hurt by increaseing rents but the economics of NYC make that inevitable. Nick correctly states that the affordable housing is private property. Fortunately for its owners, those who are not getting at least an (approximately) 8% return on their investment (not a bad profit!) can ask the state housing agency for a rent increase. That requires that they open their books and provide some inconvenient paperwork – substantially less of a burden than tenants face in housing court. I (and other tenant advocates) have no problem with landlords making a decent return on investment. But landlords who aren’t can either apply for an increase or sell their buildings. The real questions are (1) why a landlord would buy a building using an investment plan that relies on a 20% turnover of (soon-to-be-deregulated) apartments every year – as was the case at the Riverton in Harlem a few years back, and (2) why banks agree to finance such plans. No one forces someone to become an owner of a primarily rent regulated building. The amount of luxury development happening right now belies the threat of our returning to the era of decline and abandonment. Developers are scrounging to build on every square foot of formerly forgotten neighborhoods. Rent affordability for low income workers is nothing new. Thirty years ago when I was first out on my own I shared a crap one bedroom apartment with a roommate. We both earned minimum wage which was $3.75 an hour then! I spent well over 30% of my income on my housing and did so for many years until I finished with college and had a degree. Now I live a comfortable middle class life, but I still spend about 26% of my income on rent. This is not a new issue or some sudden crisis, its always been this way if you choose to work at minimum wage. You have to gain the skills to improve yourself and work your way up. The current population of the United States is around 340,000.000 and the number of people these “advocates” say are paying 30% or more on housing is around 40,000.000 thats only about 12% of the total population. I would bet the percentage of people paying 30% or more on rent has always been at least 10% so this is no new massive crisis. The mayor wants to end vacancy decontrol and vacancy bonuses and limit the rent hikes a landlord can impose when a major capital project or individual apartment improvement is completed. Skelos Charges: An Indictment of 421-a? The controversial tax abatement figures prominently in the allegations behind the arrest of the most powerful Republican in the state.